The first was spotted by oceanographers off the Cornish Coast and marks the first time a blue whale, which can weigh up to 200 tons, has been photographed in English waters. The majestic beast was photographed by Professor Russell Wynn of the National Oceanography Centre over a deep sea canyon in the Bay of Biscay. 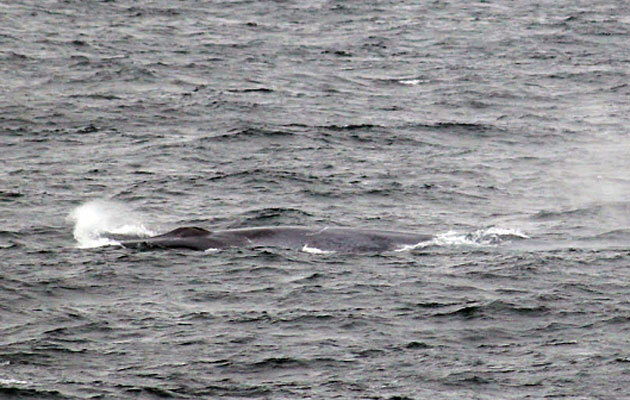 Wynn said: “I was undertaking our daily marine mammal survey and enjoying watching up to seven Fin Whales around the ship, when the Blue Whale suddenly surfaced about a kilometre away. The second oceanic behemoth interrupted a live BBC interview on Big Blue Live. Presenter Steve Backhall’s interview was cut short when the team spotted a blue what live on air. You can watch the video here.